What’s the most dangerous creature on earth? Without question the answer is: the mosquito. Mosquitoes and the diseases they spread have been responsible for killing more people than all the wars in history. Even today, mosquitoes transmitting malaria kill 2 million to 3 million people and infect another 200 million or more every year. Tens of millions more are killed and debilitated by a host of other mosquito-borne diseases, including filariasis, yellow fever, dengue and encephalitis. But for millions of Americans, malaria is something other people get somewhere else. The fact is that nearly half of the world’s population is at risk for malaria. Residents of the United States are not immune. Malaria has occurred in the United States, and still does on rare occasions. Mosquitoes capable of carrying and transmitting malaria still inhabit most parts of this country. And an influx of malaria-infected persons has produced localized malaria transmission in some areas of the United States. Today, however, the threat of developing encephalitis from mosquitoes is far greater than the threat of malaria in the United States. Encephalitis, meningitis and other diseases can develop from the bites of mosquitoes infected with certain viruses. These include the viruses of West Nile, St. Louis encephalitis, LaCrosse (California) encephalitis, and Eastern equine and Western equine encephalitis. Mosquitoes belong to the group of insects known as diptera, or flies. In fact, mosquito means “little fly” in Spanish. Diptera means “two wings” – the characteristic that distinguishes flies from other types of insects. What distinguishes a mosquito from other types of flies are its proboscis (long tubular mouthparts for sucking up fluids) and the hair-like scales on its body. The female mosquito’s life is often measured in weeks or months. Males typically live only about a week. The immature stages of the mosquito are less familiar to us. Mosquitoes hatch from eggs laid in places that are or will be filled with water. The eggs hatch into worm-like larvae that usually lie just beneath the water’s surface, breathe through tubes on the tail end of their bodies, and feed on microscopic organisms, such as bacteria. Thus most mosquito larvae require water containing organic material, such as leaves or sewage to serve as food for microorganisms that will be consumed by the developing mosquito larvae. In less than a week, hatchling larvae can grow and develop into comma-shaped pupae. While larvae are commonly called “wigglers” because they wiggle violently when disturbed, mosquito pupae are known as “tumblers” because they tumble through the water when disturbed. While mosquito larvae and pupae breathe through siphon-like devices, the pupal stage does not feed. Usually within three days the pupa will transform into an adult mosquito. 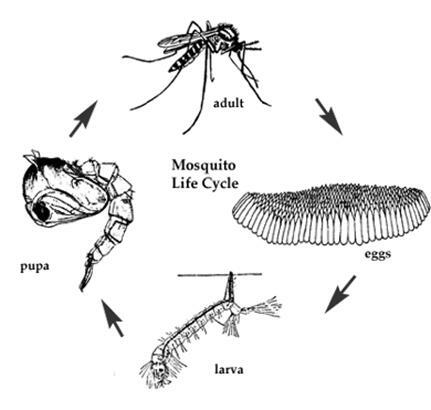 There are some notable exceptions to the standard mosquito life cycle. The larvae of some mosquito species eat the larvae of other species, though the predatory larvae of some species will develop into blood-feeding adults. Female mosquitoes can be particular about whose blood they consume, with each species having its own preferences. Most mosquitoes attack birds and mammals, though some feed on the blood of reptiles and amphibians. Only female mosquitoes bite, because a blood meal is usually required for egg laying. All male mosquitoes, and the females of a few species, do not bite. They feed on nectar and other plant juices instead of blood. Various clues enable mosquitoes to zero in on people and other animals they seek to bite. They can detect carbon dioxide exhaled by their hosts many feet away. Mosquitoes also sense body chemicals, such as the lactic acid in perspiration. Some people are more attractive to mosquitoes than others. A person sleeping in a mosquito-infested room may wake up with dozens of mosquito bites, while the person sleeping next to them has none. Similarly, people react differently to mosquito bites, some showing very little sign of being bitten, while others exhibit substantial redness, swelling and itching. This is an allergic reaction to the mosquito’s saliva, the severity of which varies among individuals. Mosquitoes can fly long distances; some more than 20 miles from the water source that produced them. But they don’t fly fast, only about 4 miles an hour. And because they typically fly into the wind to help detect host odors, fewer mosquitoes are about on windy days. As a mosquito flies closer to its target, it looks for the movement of dark objects. Once it finds you, it lands, inserts its proboscis and probes for blood vessels beneath the skin. When it finds one, it injects saliva into the wound. The saliva contains an anticoagulant that ensures a steady, smooth flow of blood. Unfortunately, the mosquito’s saliva also may contain pathogens such as malaria parasites or encephalitis virus. This is how mosquitoes transmit disease. 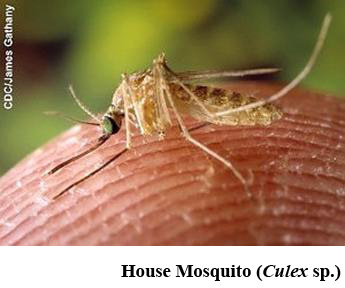 The West Nile virus is transmitted predominantly by Culex mosquitoes.Culex are medium-sized mosquitoes that are brown with whitish markings on the abdomen. These include the house mosquitoes (C. pipiens and C. quinquefasciatus) that develop in urban areas, and the western encephalitis mosquito (C. tarsalis) more commonly found in rural areas. They typically bite at dusk and after dark. By day they rest in and around structures and vegetation. Culex lay “rafts” of eggs on still water in a variety of natural and man-made containers, including tree holes, ditches, sewage and septic system water, catch basins (storm drains), non-chlorinated swimming and wading pools, decorative ponds, bird baths, flower pots, buckets, clogged gutters, abandoned tires, and water-retaining junk and debris of all sorts. They cannot develop in running water and water that is present less than a week. Therefore, every effort should be made to prevent water from accumulating in containers or, at least, empty water out of them on a weekly basis. Adult Culex mosquitoes do not fly far from where they develop as larvae. And unlike other mosquitoes that die with the coming of the first hard frost in autumn, the house mosquito can “over-winter” in protected places like sewers, crawlspaces and basements. The Aedes group of mosquitoes includes many nuisance mosquitoes, as well as species that transmit disease to humans. This is a diverse group that includes the inland floodwater mosquito (Aedes vexans), the Asian tiger mosquito (Aedes albopictus) and the tree hole mosquito (Ochlerotatus triseriatus*) – all of which prefer to feed on the blood of mammals. Floodwater mosquitoes lay their eggs on soil that becomes flooded, allowing the eggs to hatch and larvae to develop in temporary pools. Asian tiger and tree hole mosquitoes are container-breeding mosquitoes, laying their eggs in small, water-filled cavities, including tree holes, stumps, logs, and artificial containers, such as discarded tires. 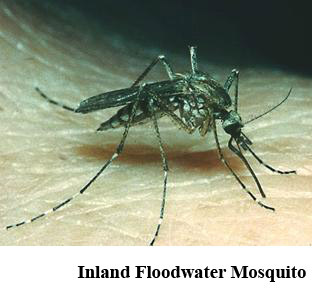 Inland floodwater mosquitoes are brown with pale B-shaped marks on their abdomens. They can become particularly bothersome after areas, such as river backwaters and other low lying places, become flooded. They are often the first mosquito noticed in spring, and later after heavy rainfall. Adults emerging together from flooded areas are often so numerous that natural controls, such as predators and parasites, are overwhelmed. Unlike some other Aedes mosquitoes, inland floodwater mosquitoes may fly more than 10 miles from their larval development sites in search of blood meals. In Illinois, they may bite more people than any other species. They typically begin flying in late afternoon and are most active after dark, but will bite any time of day if disturbed while resting in shaded, heavily vegetated areas. Fortunately, in the United States they rarely, if ever, transmit disease, and typically die in autumn with the first hard frost. Asian tiger mosquitoes are distinctive, black and white mosquitoes that bite by day (see picture on page 1). They were brought to this country in 1985, hidden in shipments of tires, and have since been found in many states including Illinois. The Asian tiger mosquito is capable of carrying LaCrosse encephalitis and West Nile viruses, though it is unclear whether the mosquito transmits these to humans. 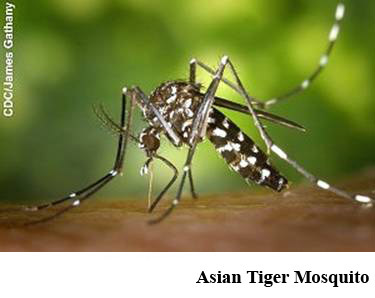 For more information, see the IDPH fact sheet on Asian tiger mosquitoes. The primary vector (carrier) of LaCrosse encephalitis is the tree hole mosquito. It is a dark mosquito with silvery white spots on the sides of its thorax and abdomen. Like the Asian tiger mosquito, the tree hole mosquito bites by day and lays its eggs in small containers where water will pool, such as tree holes, discarded tires, cans, buckets and barrels. They often are found in and around wooded areas. * Ochlerotatus triseriatus, the tree hole mosquito, was formerly known as Aedes triseriatus. The cycles of mosquito-borne viral encephalitis and meningitis diseases are similar. Most involve various bird species that are said to be reservoirs. Once infected by a mosquito bite, the reservoir species are usually not seriously affected. They will, at least for a time, produce enough virus in their bodies to infect mosquitoes. In this manner, mosquitoes pick up the virus and may become vectors, or organisms that transmit the disease to other animals, such as birds, horses or humans. Horses and humans are generally thought of as “dead-end” hosts because they do not produce enough virus to infect mosquitoes. Thus, dead-end hosts are not involved in the spread of disease. For any particular season, the number of human encephalitis cases is not easily predicted. The occurrence of some encephalitides seems to be cyclic. This may be due to variations in the condition of infected birds in a reservoir population. Birds may harbor enough virus to facilitate transfer to mosquitoes that bite them for only a few days after being infected. After this, they do not serve as a reservoir for the virus. When more and more birds in an area have passed the infective stage, fewer birds are around to pass the virus to mosquitoes. Thus, fewer mosquitoes will carry the virus, and fewer people will be infected. The variation in numbers of infective vs. non-infective birds in a population may play a big part in the cyclic nature of some viral encephalitis diseases. Of course, many other factors are involved, such as the availability of food and other resources influencing the size of bird populations; the availability of sites for the development of mosquito larvae, which influences the size of mosquito populations; as well as weather, including rainfall and temperature. In 2002, Illinois led the nation in West Nile disease cases with 884 and 67 deaths. Like all encephalitis producing viruses, West Nile virus survives in birds and/or mammals, using them as reservoirs. Most birds and mammals survive infection, while the mosquitoes that bite them can ingest the virus and infect other animals they bite, including humans. The virus can affect some birds and mammals, such as crows, blue jays, squirrels, horses and humans, more seriously than others, producing severe illness and death. However, about 80 percent of humans develop no symptoms after being infected with the virus, developing at least a temporary immunity. Persons older than 50 years of age, and those with compromised immune systems, are much more likely to develop West Nile fever, a flu-like disease that may last for weeks, or life-threatening nervous system complications such as meningitis or encephalitis. Similar to West Nile virus and also transmitted by Culex mosquitoes, the virus that causes St. Louis encephalitis is known for periodic outbreaks in the human population. In the United States, its occurrence has been limited compared to that of West Nile virus, and St. Louis encephalitis is usually confined to the southern portion of the United States, especially the Mississippi Valley. Compared to West Nile virus, St. Louis encephalitis has a lesser potential for producing epidemics. First noticed in St. Louis, Missouri, the largest epidemic occurred in the mid-70s when nearly 2,000 human cases were reported. Birds serve as a reservoir for the virus. Outbreaks of these related encephalitis viruses are rare. Several different mosquito species are suspected vectors of Eastern equine encephalitis, while Culex tarsalis, known as the western encephalitis mosquito, is the vector of Western equine encephalitis. Their uncommon occurrence is fortunate because, of all encephalitides, the equine encephalitides may have the highest potential for human mortality. This group of encephalitis viruses is unique in several ways -- it usually produces relatively mild illness in humans, and mammals, rather than birds, act as reservoirs for the virus. The most common California encephalitis virus in the Midwest is LaCrosse. The LaCrosse virus is unique in that it primarily affects children, and because the virus can pass from a female mosquito to her offspring, mosquitoes can become infected without having to feed on an infected host. Death from LaCrosse encephalitis is rare, but affected children may suffer from seizures and other nervous system complications that can persist for years. 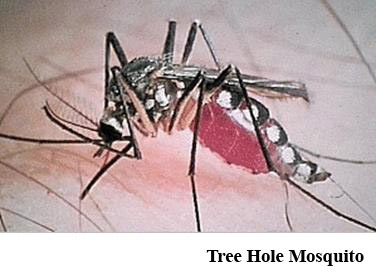 The disease is carried byOchlerotatus triseriatus, the tree hole mosquito. It bites humans after feeding on squirrels and chipmunks. LaCrosse encephalitis is associated with wooded areas inhabited by these rodents. Because the tree hole mosquito develops in natural cavities and in artificial containers, and because adults do not fly far from their larval development sites, there is increased potential for LaCrosse encephalitis where tires and other debris accumulate near wooded areas. One strategy to prevent mosquito bites is avoidance. But even if one were to remain indoors throughout the mosquito season, they might still encounter mosquitoes. Mosquitoes, such as the house mosquito, are adept at getting into structures to feed on the inhabitants, and also to use crawlspaces, basements and cellars as quiet spots in which to shelter themselves for the winter. It is important to keep structures in good repair, maintaining the integrity of window and door screens and weather stripping, and screening or sealing all gaps through which mosquitoes might enter, such as spaces around utility lines, vents, foundation cracks, and gaps around windows and doors. Repellents are the first line of defense against mosquito bites. Many products provide somedegree of protection against mosquito bites. However, certain active ingredients provide better protection. For many years, DEET (N,N-diethyl-meta-toluamide) has been the standard by which products are measured. When applied according to label direction, products containing 20 percent to 30 percent DEET provide protection against mosquitoes that lasts several hours. Products containing much higher percentages of DEET are available, but generally do not provide significantly longer protection. Recently, products containing another active ingredient, picaridin, have been shown to provide a similar degree of protection, and without the familiar odor and stickiness of DEET products. A third ingredient, lemon oil of eucalyptus, is a plant-derived compound that also is capable of providing protection, though not as long-lasting as that provided by products containing DEET or picaridin. Whatever repellent you choose, be sure to read the label directions before applying to yourself or to children. Products containing lemon oil of eucalyptus should not be applied to younger children. Historically the most effective mosquito control has been larviciding, which is the application of pesticides formulated to kill mosquito larvae before they become biting adults. The Illinois Department of Public Health promotes mosquito control by advising and funding local health departments and other organizations that conduct larviciding, as well as mosquito surveillance. Surveillance includes the collection and identification of mosquitoes that helps predict mosquito and disease outbreaks and the focusing of control efforts in problem locations. Larviciding typically involves applying pesticides containing methoprene or Bacillus thuringiensis israelensis or B. sphaericus bacteria, to water where mosquito larvae develop. As mosquito larvae feed, the Bacillus are ingested. Once ingested, a bacterial toxin perforates the mosquito’s gut, killing it. Larvicides containing the insect growth regulator, methoprene, work by disrupting the larva’s metamorphosis, preventing it from developing into an adult. The toxicity of both types of larvicide is quite low, and both are considered safe to use in waters containing fish. These larvicides can be purchased at discount and hardware stores, and lawn and garden centers for private individuals to use on their property. They can be used effectively where it is undesirable or impractical to empty the water in containers, such as water in decorative pools or horse watering tanks. Goldfish (Carassius) and mosquito fish (Gambusia) can be used for this purpose as well. Other types of larvicides include those that cover the surface of the water with thin films of liquid designed to prevent larvae from obtaining oxygen at the water’s surface. Commercial pest control operators or municipal public works personnel who wish to apply larvicides to property they do not own must attend special larvicide training or become certified in mosquito control through the Illinois Department of Agriculture (phone 217-785-2427 for details). The application of pesticides to control adult mosquitoes (adulticides), except for general use pesticides applied on the applicator’s property, requires mosquito control certification through the Illinois Department of Agriculture. Control of adult mosquitoes usually involves application of fine droplets of pesticides released as a space or ultra low volume (ULV) treatment from specialized truck or aerial equipment. This type of “fogging” can have a significant impact on localized mosquito populations. But while larviciding is a treatment that selectively kills mosquito larvae, adulticiding is a broad spectrum application that can kill beneficial insects as well as mosquitoes. Adulticiding is also much more expensive than larviciding and, to be effective, requires precise product and equipment selection and calibration, accurate, thorough application and timing, as well as favorable environmental conditions (generally in the evening when mosquitoes are active, temperature is between 60 F and 85 F, and there is little wind). Adulticiding should be seen as a supplement to larviciding, to be used when mosquitoes become too numerous or when high levels of virus activity in mosquitoes threaten populated areas with disease. Mosquito surveillance, such as trapping mosquitoes and testing them for pathogens like the West Nile virus, can help determine the potential for disease transmission in an area, and this information should be considered whenever the use of adulticides is contemplated. Public notification also should take place before treatments are applied, and persons voicing questions and concerns should be answered. In addition to the application of adulticides by fogging, some adulticides can be applied to surfaces where mosquitoes rest, such as vegetation and the exterior walls of structures. This involves applying liquid pesticides as a coarse spray. This type of application is more localized and less demanding than fogging with regard to environmental conditions and expense. Reducing the amount of vegetation around the edges of ponds or around your home can, in turn, help reduce the amount of suitable development sites for mosquito larvae and resting places for adults, and further reduce the need to treat these areas with pesticides. Perhaps the best means of controlling mosquitoes is to deny them a place to develop. This is source reduction, the elimination of water from places where mosquitoes lay eggs. This can be accomplished by draining ponds, ditches, backwaters and lagoons, and by keeping water out of natural and artificial containers. Each of us has an obligation to make sure our properties are free of mosquito-breeding sites, such as stagnant ponds, poorly maintained swimming pools, tree holes, abandoned tires, bird baths, buckets or other debris in which water accumulates. In recent years, various mosquito trapping devices have been produced. Many are ineffective against mosquitoes. Some may catch substantial numbers of mosquitoes in some situations, but the traps can be expensive and their use has not been shown to lower the risk of mosquito-borne disease. Source reduction, pesticide application and the use of mosquito repellent remain the best ways to prevent mosquito bites. Photos and illustrations courtesy of the U.S. Centers for Disease Control and Prevention, Ohio State University and Texas A&M University. For more information contact the Illinois Department of Public Health, Division of Environmental Health, 525 W. Jefferson St., Springfield, IL 62761, 217-782-5830, TTY (hearing impaired use only) 800-547-0466.